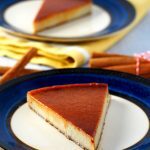 This Cinnamon Flan is a smooth and creamy custard dessert infused with the warm flavor of cinnamon and topped with a sweet caramel topping. In a 9-inch aluminum round baking pan, place the sugar in an even layer, covering the entire bottom surface of the pan. Place the pan directly on the stove over low heat. Let the sugar melt without stirring. The sugar will start to melt one section at a time and turn translucent. It will then turn into a caramel color liquid. Once the sugar is mostly caramelized, turn off heat. With hand gloves on, gently tilt the pan around to distribute the caramel evenly across the entire pan. It is important to do this right away because the caramel will quickly harden. Set the pan aside. Pre-heat oven to 350 F. Combine milk, cream, cinnamon, and vanilla in a bowl and whisk to incorporate. In another bowl, lightly stir the eggs and the egg yolks together, whisking gently just to break the yolks. Stir the eggs to the milk mixture. Strain the custard over the caramel in the pan. Place a roasting pan in the middle rack of the oven. Gently place the cinnamon flan in the center of the roasting pan. Gently fill the roasting pan with water until the baking pan is submerged halfway. Close the oven door and bake for 50-60 minutes. The custard should cinnamon in the edges and the middle just jiggles very slightly. Cool the cinnamon flan. Refrigerate overnight to set fully. To serve, run a knife around the edges to loosen. Turn over on a rimmed serving plate.